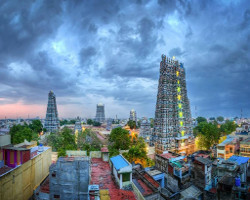 Madurai is an energetic, ancient city on the Vaigai River in the South Indian state of Tamil Nadu. It is the place where the Tamil Sangam functioned and great literary works were created and presented to the forum and the people leading to a tremendous growth in the Tamil language. It can also be called another temple city of Tamil Nadu as it is dotted 14 colourful gopurams (gateway towers) of Meenakshi Amman Temple. Covered in bright carvings of Hindu gods, the Dravidian-style temple is a major pilgrimage site. Millions attend the processions and ceremonies of April's Chithirai Festival celebrating Meenakshi and Lord Vishnu. There are many tourist spots worth a visit including Sri Meenakshi temple, Alagarkoil temple, Gandhi Museum, Pazhamudhirsolai, etc. The city is known for its night life with eateries open all 24 hours â€“ there are famous items from the city such as the Jasmine and other flowers, Jigirdnanda, etc. Thanjavur, formerly Tanjore, is a city in the south Indian state of Tamil Nadu. Thanjavur is an important centre of South Indian religion, art, and architecture. 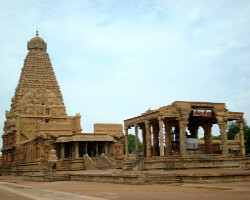 Many Great Living Chola Temples, which are UNESCO World Heritage Monuments, are located in and around Thanjavur. The foremost among these, the Brihadeeswara Temple, is located in the centre of the city. Thanjavur is also home to Tanjore painting, a painting style unique to the region. The city is also an important agricultural centre located in the Cauvery Delta and is known as the "Rice bowl of Tamil Nadu". The city served as the capital of the Medieval Chola empire.After the decline of Cholas, the city has been ruled by the dynasties like Pandiyas, Vijayanagar Empire, Madurai Nayaks, Thanjavur Nayaks, Thanjavur Marathas and British Empire. The legacy of these dynasties has left their marks in the city. 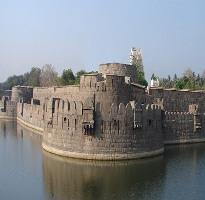 Vellore is a sprawling city and the administrative headquarters of Vellore District in the South Indian state of Tamil Nadu. Located on the banks of the Palar River in the north-eastern part of Tamil Nadu, the city has been ruled, at different times, by the Pallavas, Medieval Cholas, Later Cholas, Vijayanagar Empire, Rashtrakutas, Carnatic kingdom, and the British. Vellore City is the home of two of India's top ten educational institutions, Christian Medical College & Hospital and VIT University. It is also a major centre for medical tourism in India. There are several tourist attractions in and around - Vellore Fort, Government Museum, Science Park, Vainu Bappu Observatory, Amirthi Zoological Park, Religious places such as Jalakandeswarar Temple, Balamathi Hills [Murugan Temple)Vallimalai (Murugan Temple) Ratnagiri (Murugan temple) [Sripuram|Srilakshmi Golden Temple]], Big Mosque and St. John's Church and Yelagiri Hill station. Vellore is also a top exporter of finished leather goods in the country. Vellore leather accounts for more than 37% of the country's export of leather and leather related products.The city is also home to many manufacturing and automobile companies such as Bharat Heavy Electricals Limited, MRF Limited, TVS-Brakes India, Tamil Nadu Industrial Explosives Limited, Greaves Cotton, ArcelorMittal Dhamm Processing, SAME Deutz-Fahr (Italy), Mitsubishi Heavy Industries (Japan) and KRAMSKI (Germany). 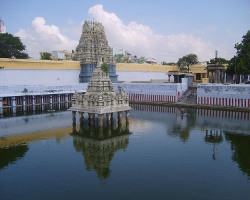 Pichavaram is located near Chidambaram in Cuddalore District, Tamil Nadu, in South India. The nearest railway station is Chidambaram from where it is accessible by road. 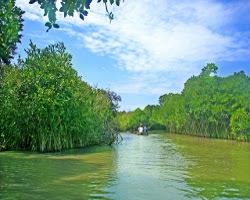 The Pichavaram Mangrove Forest near Chidambaram is the world's second largest mangrove forest. The major attraction is the waterscape and the backwater cruises. The Pichavaram mangrove forest is located between two prominent estuaries, the Vellar estuary in the north and Coleroon estuary in the south. The Vellar-Coleroon estuarine complex forms the Killai backwater and Pichavaram mangroves. The backwaters are interconnected by the Vellar and Coleroon river systems and offer abundant scope for water sports such as rowing, kayaking and canoeing. There is also the very rare sight of the mangrove forest trees are permanently rooted in a few feet of water. There are more than 400 water routes available for boating. Kodaikanal is a hill town in the southern Indian state of Tamil Nadu. It is one of the famous summer hill station resorts in Tamil Nadu. It is situated in an area of granite cliffs, forested valleys, lakes, waterfalls and grassy hills. 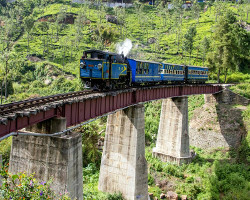 At 2,000 meters above sea level, the town centres around man-made, star-shaped Kodaikanal Lake, bordered by evergreen forest. Rowing boats can be hired, and hikers and cyclists follow the 5k Lake Road path around the shore. The major attraction - flora Meadows and grasslands cover the hillsides. Gigantic Eucalyptus trees and shola forests flourish in the valleys. Mighty rocks and cascading streams lie above the valleys. There are many high waterfalls and ubiquitous gardens and flower beds in bloom. Kodaikanal is known for its rich flora. Of the big trees, cypress, eucalyptus and acacia are the dominant varieties. Pear trees are numerous and the fruits are of high quality. Competing with the fruit trees are the flowering ones - mainly rhododendron and magnolia. 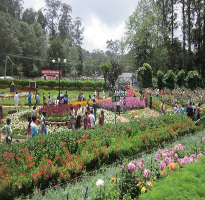 Large dahlias of different hues are the main attraction of Bryant Park, situated close to the Kodai lake. Water lilies in the park's pond are another pleasing sight. The town abounds in a kind of beautiful yellow wild flowers. The Hogenakkal Falls is a waterfall in South India on the Kaveri river in the Dharmapuri district of the Indian state of Tamil Nadu. It is located 180 km from Bangalore and 46 km from Dharmapuri. It is one of the most popular â€˜outingâ€™spots for relaxation. The Kaveri river is considered to originate at Talakaveri in the Brahmagiri hills in the Western Ghats of South India and gathers momentum as the land drops in elevation. 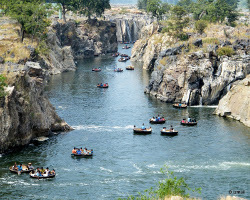 It becomes larger as various tributaries feed into it on the way down.At Hogenakkal, the Kaveri, now a large river, drops and creates numerous waterfalls as the water cuts through the rocky terrain. The river carries sediment which makes the downriver land fertile. At Hogenakkal the river spreads out over a wide area of sandy beaches, then flows through to the Mettur Dam and creates a 60 sq mi (160 km2). lake called Stanley Reservoir.